We need to raise £1,000,000 by 2019 to fund an essential tunnel under a major Lichfield railway line! The Lichfield Canal route takes us under the busy Cross-city railway line from Lichfield to Birmingham. To get through this obstacle we need to build a tunnel. There are plans by County Highways to extend the Lichfield Southern Bypass by building a tunnel for the new road under the same railway line. It will be immensely more difficult, and substantially more expensive, to build our tunnel after the road is completed, so we need to build our tunnel at the same time as the road tunnel and the work must begin many months before that. The County Highways have an Agreement in Principle with Network Rail to drive the road through and install a new tunnel for the road during a brief possession of the line, in late 2019. "Enabling work managed by Staffs County Council is now progressing to gain access to the railway embankment where a bridge over the Lichfield Southern Bypass extension is to be installed during Christmas 2019. Agreements require part of the bypass to be funded by Persimmon Homes needed for access to their new St. John's housing estate with two bridges over the diverted route for the Lichfield Canal. Enabling work managed by Staffs County Council is now progressing to gain access to the railway embankment where a bridge over the Lichfield Southern Bypass extension is to be installed during Christmas 2019. Agreements require part of the bypass to be funded by Persimmon Homes needed for access to their new St. John's housing estate with two bridges over the diverted route for the Lichfield Canal. 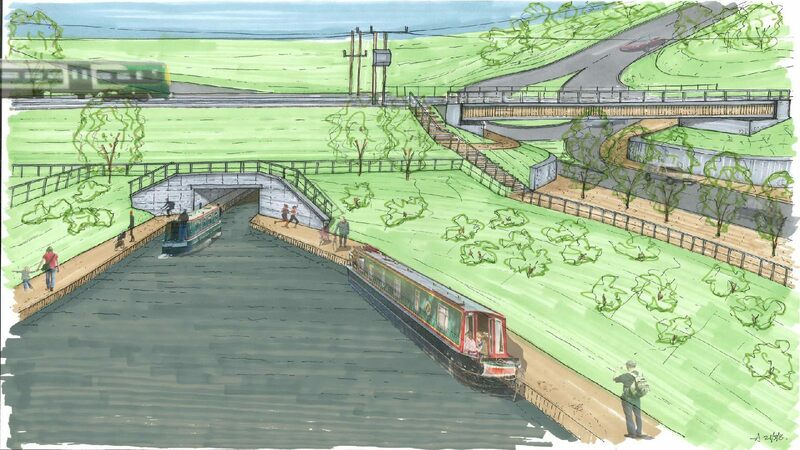 Following completion of the bypass bridge in early 2020, land needed for the canal becomes available for a contractor to drive a tunnel structure through the embankment. Engineering details are now coming into sharper focus for Planning Permission, Network Rail approval and land acquisition with the Target Cost of £1,000,000 set some years ago being updated. Although L&H Trust's David Suchet Tunnel Vision Appeal has raised well over 1/2 the cost, it is expected that further promotion and approaching institution funders will make it possible to "See It Through" during 2020.